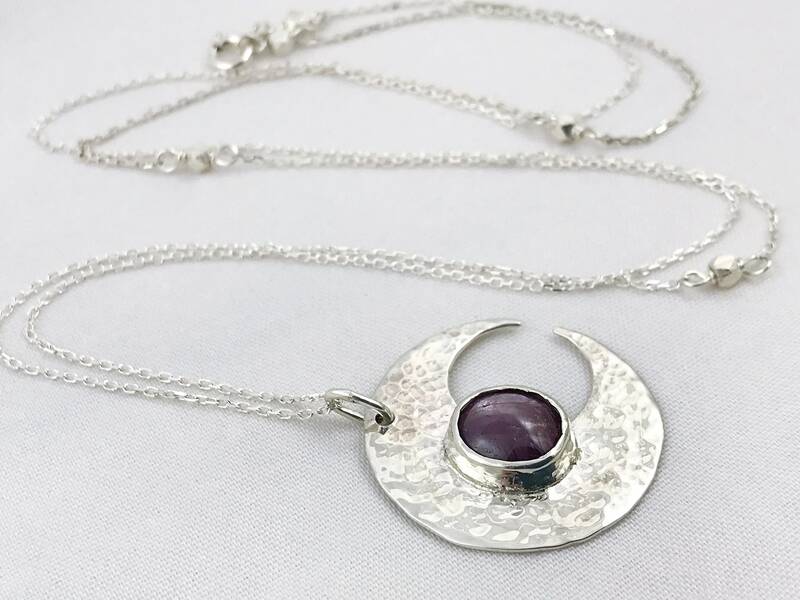 This one of a kind sterling silver crescent moon necklace features a genuine Mysore star ruby as the centerpiece of the design. Rustic and completely hand forged, it features lots of rich hammer texture and hand tool markings which create beautiful light play and a bit of old world aesthetic. 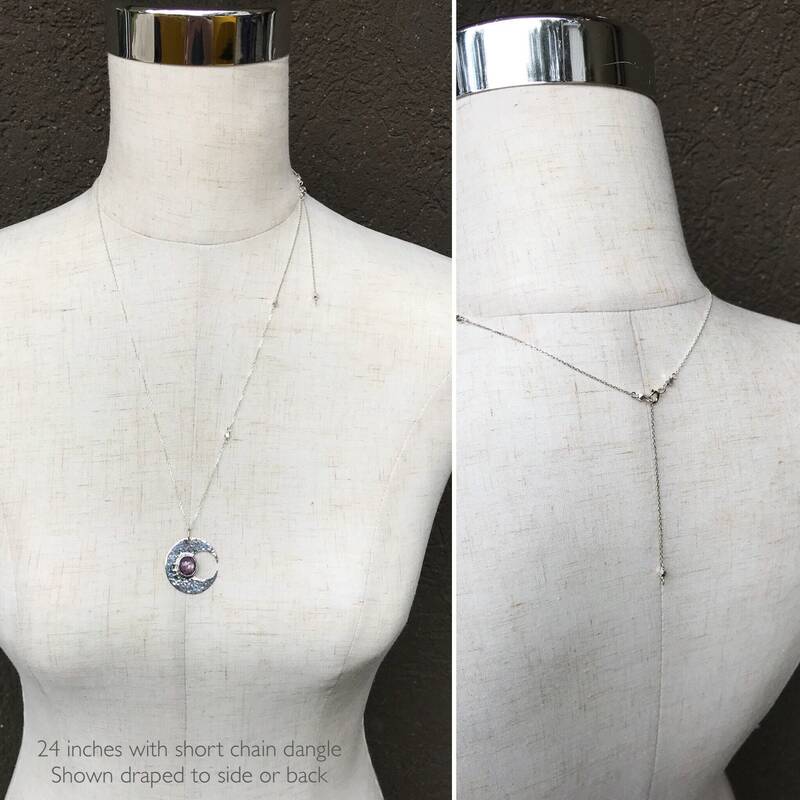 Dangling from an adjustable length sterling chain with hand carved fine silver (99.9% pure silver) nugget bead accents. 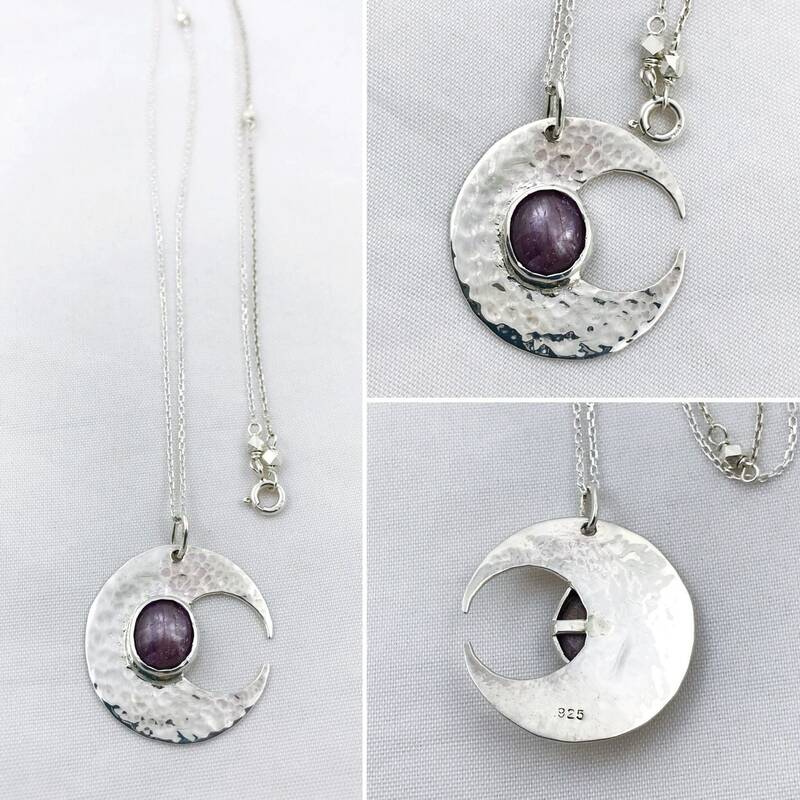 Necklace has been photographed in both indoor and outdoor light, at various angles and light directions to attempt to show all of the features and light play of the stone, as well as the adjustable length feature shown in the last four photos. 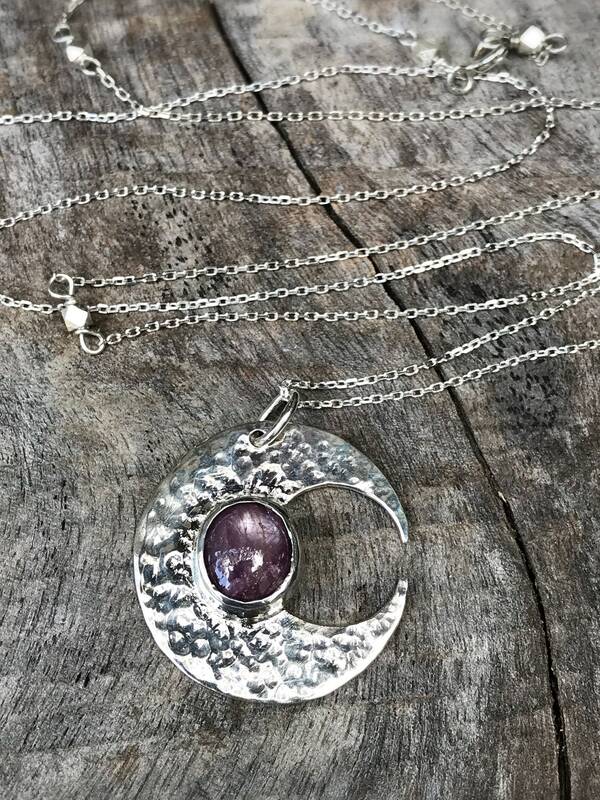 -Pendant is hand sawn/shaped and completely hand forged of solid 20 gauge sterling silver. -Pendant measures 27mm (1 1/16") tall (not including jump ring which adds about 1/4"), 26mm (just over 1") wide, 5mm (3/16") deep at deepest part where ruby is bezeled. Moon crescent is 1mm in thickness. -A genuine Mysore star ruby is set very securely at the center of the pendant in a solid sterling silver bezel. Ruby itself measures about 10mm tall, 9mm wide and 4mm deep. 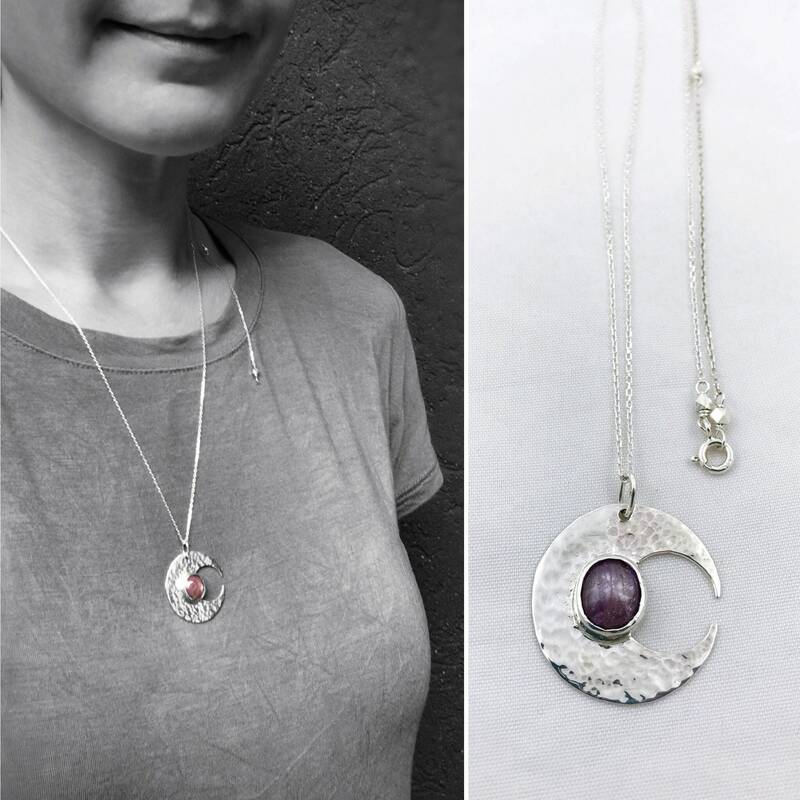 -Ruby is opaque with a silky luster, red-violet in color, and displays the signature "Asterism" which appears as a sharp six-ray star under certain lighting and a more diffused silky glow under certain lighting. -The whole piece is very rustic and rough-hewn in design, featuring hammer texture, hand tool markings and distressed edges for lots of light play and visual interest, as well as a truly unique handmade feel. -Pendant dangles from a solid sterling silver 1mm diamond cut cable chain, which adds plenty of sparkle all it's own. Chain features five 3mm hand carved fine silver hexagon nugget beads and is finished with a spring ring clasp. -Chain is adjustable: Spring clasp can be linked at any of the bead accent links (shown in the last four photos). 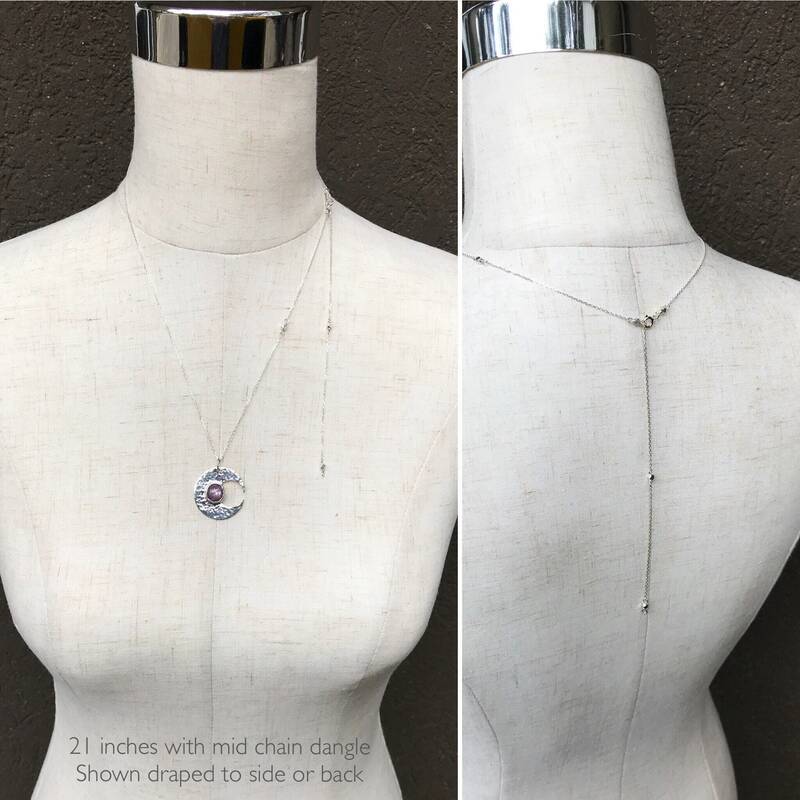 Chain will adjust to any of the following lengths: 18 inches, 21 inches, 24 inches, 27 inches. 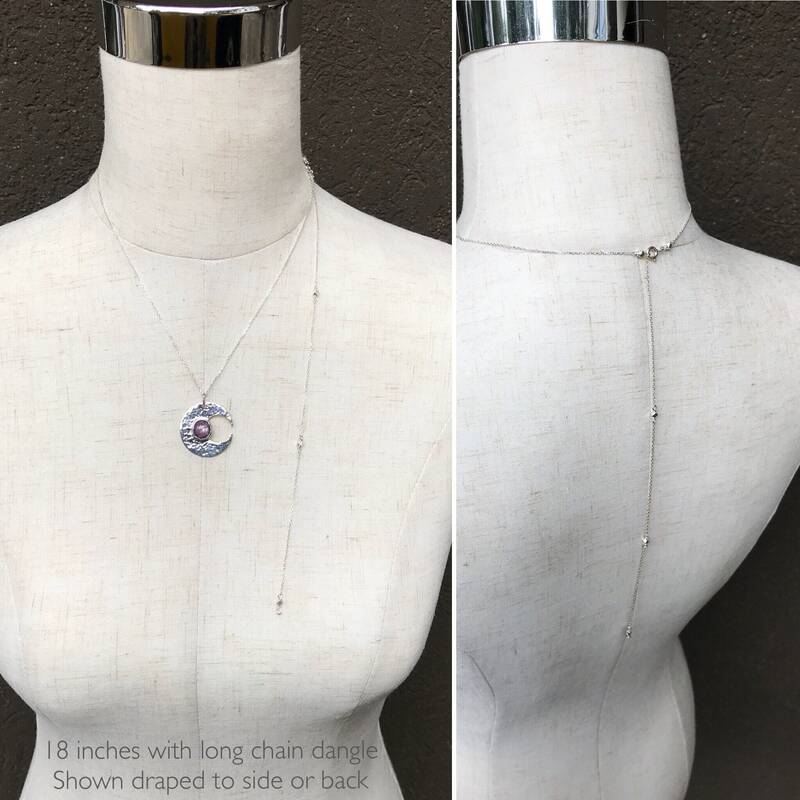 -When clasped at any of the three shorter lengths, the remaining length of chain creates a dangle feature which can drape down the back or at the side of the necklace (also shown in photos). 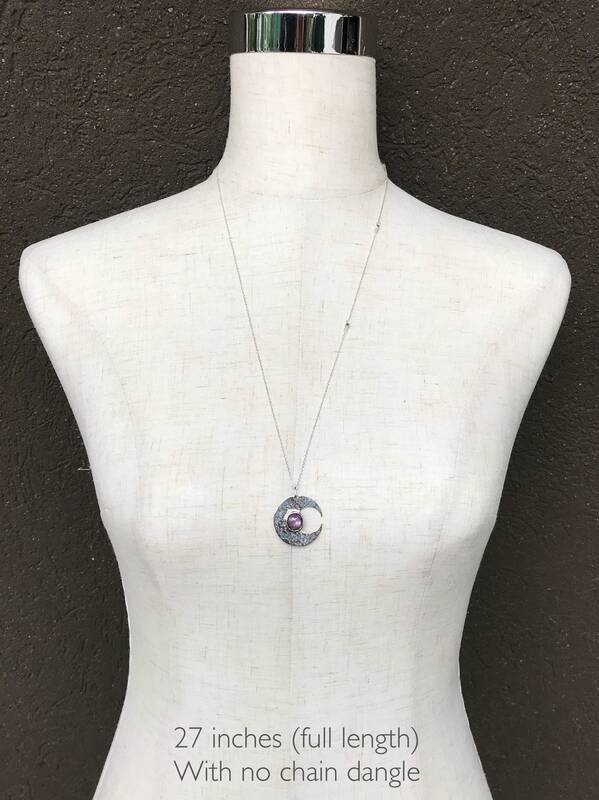 When worn at full 27 inch length, beads sit beautifully above the pendant along one side of the chain with no dangle feature. 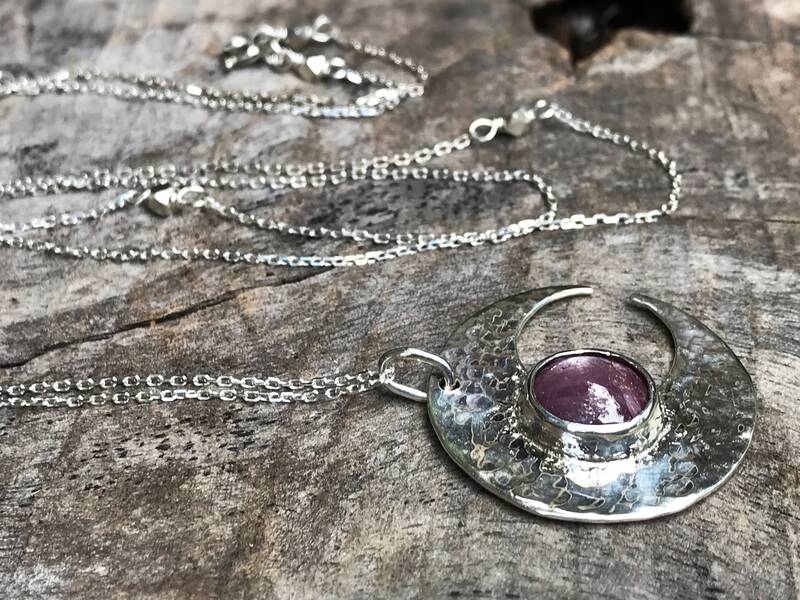 Star ruby is a rare variety of precious ruby that exhibits "Asterism": A six-rayed star that shimmers over the surface of the stone when it is moved. The star effect is owed to needle-like rutile inclusions within the ruby. It is the rutile which is responsible for its silky shine. Rubies can range in color from pinkish red to orangey, purplish and brownish-red, depending on their chromium and iron content. 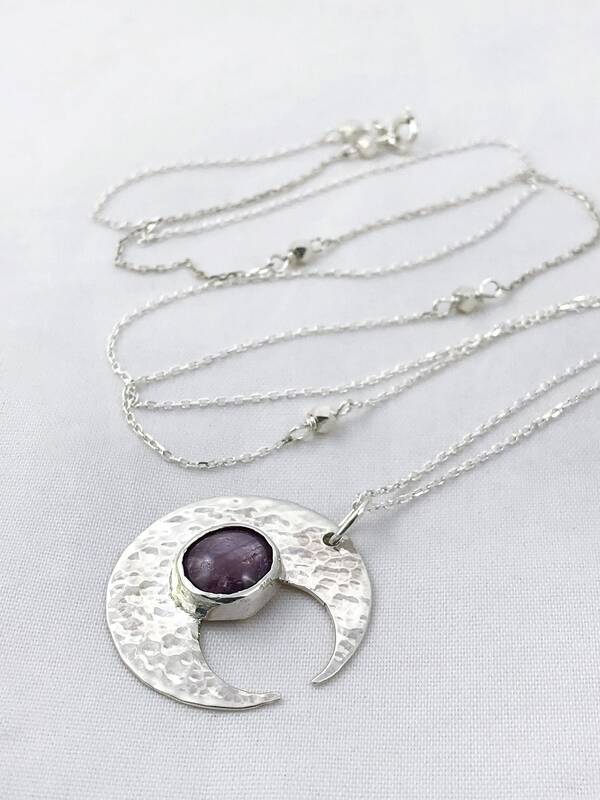 The star ruby in this design is red-violet in color and opaque with beautiful inclusions. The color of this stone appears lighter or darker, more red or more purple under different lighting. The star "asterism" under certain lighting appears as a sharp six ray star, and under certain lighting appears as a more diffused silky luster across the surface of the stone.